Born and raised in Houston, Texas, Ken Bradshaw started surfing at the age of 13 at Surfside Beach, Texas. Searching for better waves than those found in the Lone Star state, Ken moved to California in 1969 and by 1972 was ready to attempt the big waves of Hawaii’s Sunset Beach. 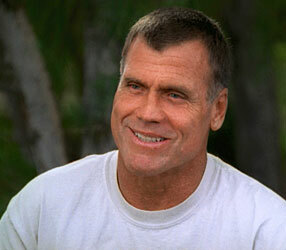 Ken mastered big-wave surfing on Oahu’s North Shore, not only at Sunset, but also at the legendary Waimea Bay. Through the late 1970s and early 1980s, he gained nicknames like Ken Kong, The Shaw of Sunset, and Planet Crusher. His first of many big victories in professional surfing was the ABC’s Wide World of Sports Duke Kahanamoku Surfing Classic in December, 1982. On January 28, 1998, Ken rode the biggest wave ever surfed — a colossal 85-footer — on the North Shore of Oahu, Hawaii, at an outer reef known as Outside Log Cabins. He also rode another 20 waves between 40 and 65 feet to solidify this date as a historic one in surfing. 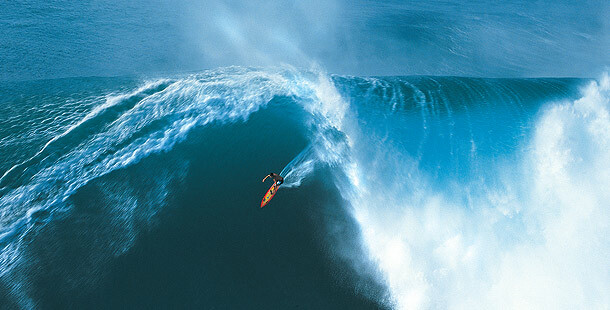 In December 2001, NATURE Online spoke to Ken about big-wave surfing, including his record-breaking ride. Most people would see a 25-foot wave and run in the other direction. What is it about surfers that make them want to ride big waves? Well, not all surfers are big-wave surfers. Those who are have a certain passion and a deep desire to challenge themselves by surfing waves of that magnitude. January 28th, 1998 was an important day in the history of surfing. Can you share with us what that was like? That day represents the culmination of 25 years of desire and observation. For three years prior to 1998, we had been experiencing increasingly large swells. So over a period of time, we kept learning how to surf better on bigger waves and by 1998, we were ready for the challenge of a 40-foot wave. On Super Bowl Sunday — the Sunday before Wednesday, January 28 — we got really big 35-foot waves. We still had not seen a 40-footer, but knew that the swell would come. Then something happened that’s only happened 10 times or so since I’ve been in Hawaii, and that is that Waimea Beach closed out — that is to say, waves spanning the half-mile wide beach started breaking all at once, which means that they’re just massive. In the show you talk a little about your relationship with the ocean. What is it about the water that’s so gratifying? The ocean represents balance in my life. I get frustrated with the daily struggle of my “real life” out of the water, and being in the water in the surfer world is the antidote to that. Why are larger waves so much harder to surf? Is it because it’s difficult to catch up to the speed of the wave? Before the advent of tow-in surfing, in which surfers have the benefit of the aid of a personal watercraft helping them catch waves, we couldn’t match the speed of these big waves. This “unridden realm,” as we called it, was unsurfable — we didn’t even talk about the possibility of riding these enormous waves in the 1960s and 1970s. In the 1980s, we began to talk about it and figure out how it might be done, and in the 1990s we actually began to do it. What made it even possible to talk about was the development of stand-up personal watercraft in the mid-’80s. These weren’t very powerful, but when the true personal watercraft came — the sit-down kind — this was really the event that allowed us to surf the kind of waves we had only dreamed and talked about before. You began tow-in surfing in 1995. Was there initial resistance to this new kind of surfing? Yes, there was. But once photos were published for the first time in a surfing magazine showing tow-in surfing, it became more valid. Personally, when I first started doing a few tow-ins, I discovered that the boards we were using — 10 and a half and 11 feet long — were really slow and big and clumsy. So we started to use shorter boards — first 9 feet, then, the next year, 1993, some used a 7-foot, 2-inch-long board. It changed our whole perception of how to surf big waves; instead of merely riding the waves, we could turn and go much faster. Can you describe what happens to your body and mind when you wipe out? To get beat up by a wave, survive it, and get up to do it again in the space of 15 minutes is as much about physical conditioning as it is about mental toughness. There’s no way a lay person could ever understand what it feels like, but if I were to describe it I would say that it feels like getting hit by a car, a soft car, and then spun around in a washing machine. This all happens in complete darkness, so that once you stop spinning you’re presented with the challenge of finding your equilibrium and figuring out which way is up. Not to mention the pressure change: You can be pushed from the water’s surface 50 feet down in less than a second, which is a pressure change of two atmospheres. If you survive the pounding of one wave, you can be hit by a second one in less than 20 seconds, and then a third can pull you down into what we call a “triple hold.” Getting held underneath the water by three waves is probably the maximum that a person can take and still survive. I’ve only known two people who successfully negotiated a triple hold. After that, you’re out of luck. Is surfing a sport that the “Average Joe” can do? How many years does it take until one can surf the North Shore? Not really. It takes about 10 to 15 years for a regular surfer to become proficient enough for true big-wave surfing. It doesn’t just happen overnight, but it is a gradual process of starting with small waves, then trying to surf in Hawaii, first at Sunset Beach and then moving up the ladder to Waimea, and then, finally, the outer reefs. You’ll find that most big-wave surfers are in their late 20s or early 30s; younger surfers just aren’t experienced enough to ride the big waves.